The iPhone 4 has a steep but relatively straight and smooth Intensity Scale that partially compensates for its weak Color Gamut and color saturation. The new iPad has a virtually perfect and accurate Intensity Scale that matches the Standard and it also complements its very accurate Color Gamut. The iPhone 5 and Galaxy S III both have slightly steep Intensity Scales that introduce more image contrast and color saturation into their images over and above the Standard Intensity Scale. 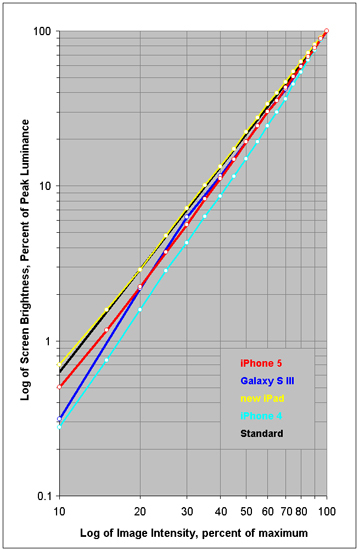 While the iPhone 5 Intensity Scale is very smooth and straight, the Galaxy S III steepens significantly at the dim-end.